Durable Medical Equipment pieces are like children...I presume. [Tangent: I'm totally guessing because clearly I have more experience keeping the former alive than the latter...and I'm not even spectacular at that.] In that I mean, we want our wheelchairs to be healthy and reliable and go on to do great things one day [Tangent: ...But that's probably just me. I pin a lot of hopes and dreams on objects.]. Well, where am I going with this strained metaphor? 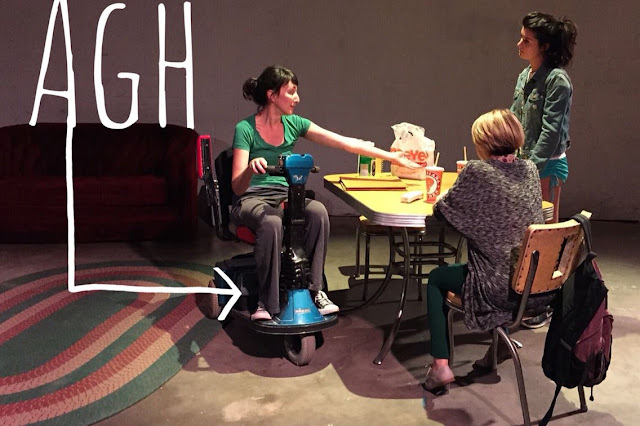 Long story short, my little blue mobility scooter, which I used all through high school and college...and beyond, made it's theatrical debut over the weekend in the Verge Theater Company's production of Slasher! About a month or so ago, my awesome and multi-hat wearing friend Nettie [Tangent: Who you all may remember as my friend who took me on the set of Nashville if I promised not to act like a total maniac. Achieved! ] 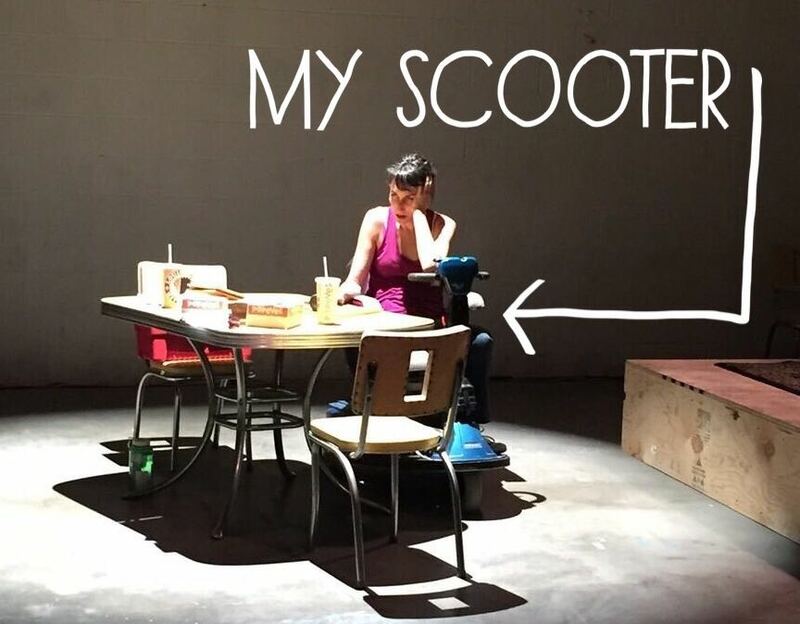 texted to ask me if I knew anyone that might have a scooter for a play she was directing. Immediately (and to her delighted surprise) I said, "Oh, I do! If you can knock off the cobwebs and find all the pieces and get it to charge, then you may totally have at it for the play!" [Tangent: I am pretty much the Jay Leno of wheelchairs and medical equipment.] I sent her a picture of my bright blue scooter that took me all over campus, and danced at proms and posed awkwardly in READ posters and paced the floors of Victoria's Secret for that really weird 3 years when I worked retail post college. Immediately she was in love and thought it would be perfect for a horror dark comedy that she was directing. So in true pushy pageant parent fashion, I thrust my scooter into show business without any consultation with it. Truthfully, and I'm not just saying this in a bizarre stage mother kind of way, but I could not have asked for a more perfect play than Slasher for ol' blue to catch the acting bug. It was weird and wonderful and fun. Seriously, The Music Man- this was not [Tangent: And I mean that to in no way cast to shade upon The Music Man...because damned if I don't love it.] unless instead of a mysterious stranger in River City, you subbed in a feminist pill-popping mother, a very meta horror movie production and a religious group with access to to bombs. Oh, and I haven't even mentioned the most exciting part? 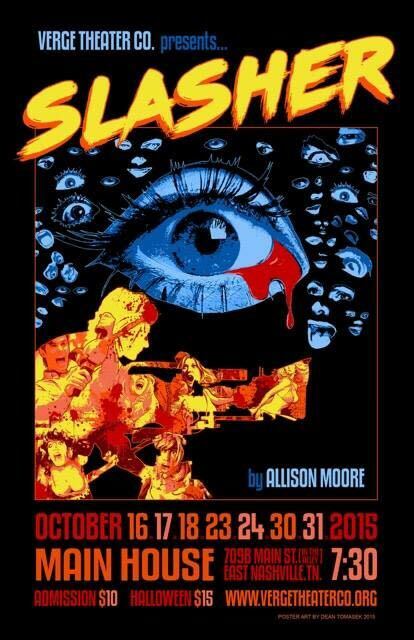 Slasher is a different kind of theater experience. It's 100% immersive, which means in lieu of standard theater seating, you are in the thick of it. At any given moment you may be kicked out of your seat by an actor or have your beer refilled during a restaurant scene or maybe even have your foot run over by a mad woman on a scooter [Tangent: Yep! MY SCOOTER!] The constant shifting makes you much more invested in the story unfolding around you. We had not idea what exactly to expect and we found the whole thing was a perfect October experience and a lot of bloody good fun... and I'm not just saying that because my friend directed it and my scooter was in it or even because Jamie got to totally nerd out and DJ the after show with his horror soundtrack collection. [Tangent: Yeah, he made his DJ debut and even though the dance party pretty much devolved into me and my friends having a dance party in all the wheelchair related props to the Beatlejuice soundtrack, I could not imagine a better and more apropo cap to the evening.] Oh and don't worry, it's not over, Verge Theater Company will be performing the play the next two weekends, so you can support the local arts [Tangent: And help my scooter's ascent to fame.] and have a ton of Halloweeny fun in the process. You can view all the details here on their Facebook Event page.